Problem: One type of virus automatically disable your Folder Options menu item from the Windows Explorer's Tools menu. Maximum computer users calling this name Folder Options virus. If any computer infected in Folder Options virus, then computer user can't change important Folder Options menu feature. Like- File extensions hide unhide, Do not show hidden files & folders, Show hidden files & folders etc. Solution: Start your computer with Administrative user. Click your Start menu and click Run… Type gpedit.msc and Press Enter Key. Maybe a windows open your computer. Windows title is Group Policy. If not Group Policy windows open in your computer then try to start computer safe mode and command prompt mode. Then double click 'Removes the Folder Options menu item from the Tools menu' in windows right side. A new windows open your computer. Here Not Configured is by default settings. Enable means Folder Options menu removes from Tools menu. Disable means Folder Options menu no change in Tools menu. Select the Not Configured or Disable radio object and click Apply button and then OK button. Press F5 function key and refresh your windows or Restart your computer. Result: Expand the Desktop and double click in My Computer icon. Select the Tools Menu to see Folder Options… menu is enable. Solution: Start your computer with Administrative user. Click your Start menu and click Run… Type regedit and Press Enter Key. Maybe regedit windows open your computer. If not regedit windows open in your computer then try to start computer windows operating system safe mode and command prompt mode. Rename this DWORD name is 'NoFolderOptions' and press Enter. Now Double-click the NoFolderOptions DWORD name and set the value data 0. Then press F5 function key for windows refresh or Restart your computer. Caution: Incorrectly editing the registry may severely damage your system. Before making changes to the registry, you should back up any valued data on your computer. Problem: One type of virus automatically change your windows show hidden files and folders option. And normally can't enable show hidden files and folders option in your windows folder options. Then computer user can't access there important computer hidden files and folders. Solution: Start your computer with any Administrative user. Click your Start menu and click Run… Type regedit and Press Enter Key. Maybe regedit windows open your computer. If not regedit windows open in your computer then try to start computer windows operating system safe mode and command prompt mode. Now Double Click on CheckedValue and type 2 in value data. Now Double Click on CheckedValue and type 1 in value data. Result: All hidden files & folders display in your Drives. Solution: Download below foldersettings.reg file in your computer windows desktop and the foldersettings.reg file double click from your computer windows desktop. Next click Yes and then click Ok. Now restart your computer. Note: If windows cannot open this file then select the program from a list radio button and click Ok. Next click Browse in Open with windows. Select C:\Windows\Regedit.exe file and click Open button. Problem: One type of virus automatically create autorun.ini file in your root disk drive (C, D, E drive). If you open any important windows in your computer in this time autorun.ini file run and automatically closed your necessary opened windows. So you can't finish your work properly. Solution: Your need a DOS supported third party software NC (Norton Commander). Collect this software and Paste this NC folder in your computer's C drive. Click Start, and then click Turn Off Computer.. In the icon, click Restart. When you see the message Please select the operating system to start, press F8 function key (means operating system starting time). Use the arrow keys to highlight Safe mode with command prompt, and then two times press Enter, and wait for starting windows. 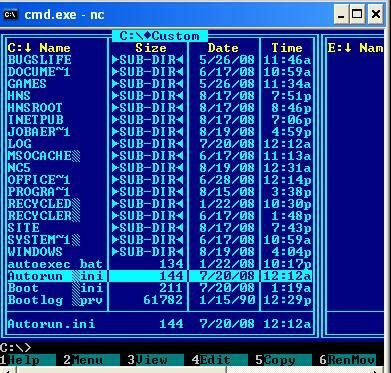 If you're safe mode with command prompt ready with a prompt, then type CD\ and press Enter. Now run NC program. If NC folder name is NC5 and this location is C root drive, then type from command prompt CD NC5 and press Enter. Again type NC and press Enter. Now NC program run your computer with C:\> command prompt. If you aren't sure how to usage Norton Commander program, ask your advance user computer friend. Select Autorun.ini file from C root drive in you NC windows and Press F6 function key, Type C:\repautorun in next rename text box and press down key for select rename. If you press Alt + F1 in NC program, then you will choused other drive (D, E) of your computer. In this time chose one by one another drive and rename Autorun.ini file by follow previous procedure. At last Press F10 and exit Norton Command. Now press Ctrl + Alt + Del and Click Shut down Menu and select Restart in Windows Task Manager. Note: If not solved your problem, then need deleted some virus file from Norton Commenter running time. Like- C:\windows\smss.exe , D:\smss.exe, C:\Funny UST Scan.exe. 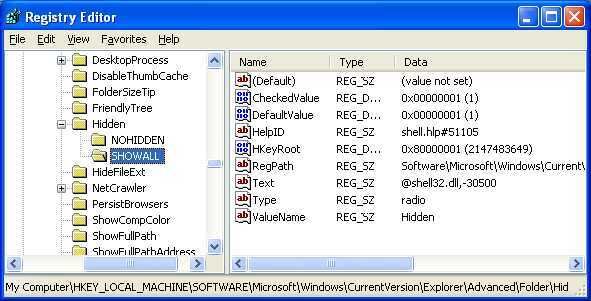 Next run regedit file and find Smss.exe, Funny UST Scan.exe value and string and delete this value or strings. Caution: Incorrectly rename any system file or, folder name in Norton Commander may severely damage your operating system. Before making changes Autorun.ini file, you should confirmed selection only autorun.ini file. Result: Not close automatically necessary windows. Like - msconfig windows, Folder Option windows, regedit windows etc. Result Tested: Some Windows XP & 2000 PC. Problem: One type of virus automatically change a web site address in your internet explorer home page. If you start your internet explorer then this site automatically open your computer. And you can't blank or change this link from internet options menu. Because virus automatic add a web site link in your home page and disable Use Current, Use Default, Use Blank button. Now double click on Start Page string and press Back Space key in value data and then Click Ok. Then click View Menu & click Refresh. 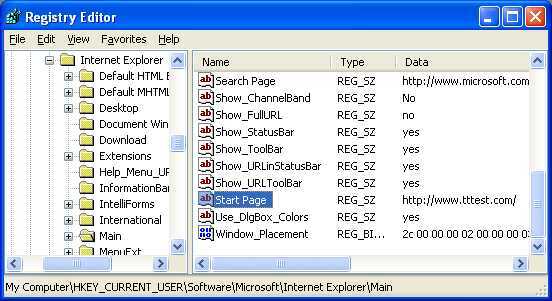 Result: Remove web site address in your internet explorer home page.